Customers tell us all the time that our gourmet chocolate bark is the most scrumptious handmade chocolate bark they've ever tasted! We make it fresh in small batches using premium Milk, Dark or White chocolate, then load it with raisins or sweet dried cranberries and your choice of pecans, walnuts, almonds or peanuts. An irresistible confection! 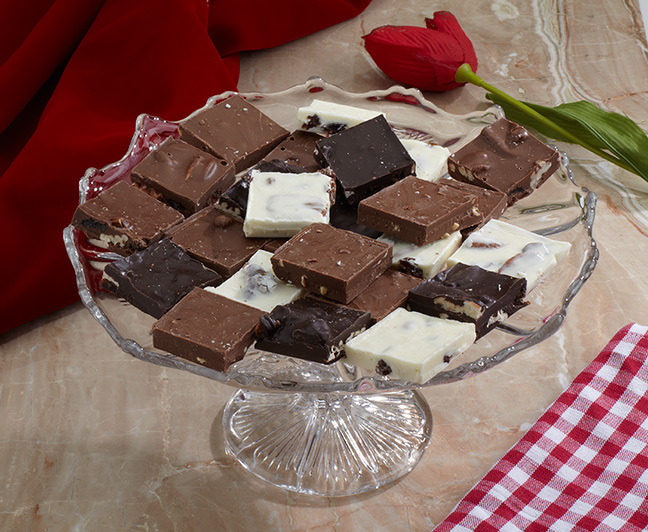 Kevin prepares handmade gourmet chocolate bark in luscious Milk, White or Dark chocolate - or a sampler of all three. Mix in sweet raisins and your choice of pecans, walnuts, almonds or peanuts for a scrumptious taste treat. Sold in boxes of 12 pieces or 24 pieces. Want to try a new flavor? Start with real cranberries in Milk, White or Dark chocolate - or a sampler of all three. Then, add your choice of pecans, walnuts, almonds or peanuts for a whole new taste sensation. Sold in boxes of 12 or 24 pieces.